James Alex Fields Jr., 20, is accused of plowing into a crowd. 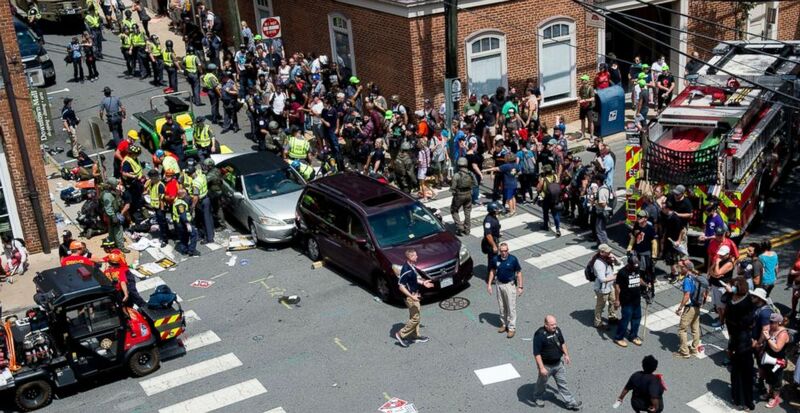 The man who allegedly drove into a group of people who were protesting a white nationalist rally in Charlottesville, Virginia, Saturday, killing a woman and injuring several others, was denied bail this morning as he secures an attorney. James Alex Fields Jr., 20, is charged with second-degree murder, three counts of malicious wounding and one count related to leaving the scene, after he allegedly plowed into the counter-protesters. Fields, who attended his arraignment via closed-circuit video, had recently moved to Ohio from where he grew up in Kentucky, The Associated Press reported. He apparently has no ties to Charlottesville. Fields, who worked as a security officer for the security company Securitas, has since been fired, the company said today. "At the time of the incident he was on a previously requested vacation leave," the company said in a statement. According to court records, Fields listed Securitas as his employer for the past two years, working for $10.50 per hour. Fields received today a court-appointed attorney who could ask for another bond hearing before Fields' next scheduled court hearing Aug. 25. A former high school classmate of the suspect told ABC News that Fields had proclaimed himself a neo-Nazi and white supremacist. Fields' mother, Samantha Bloom, told The Associated Press she knew her son was attending a rally, but she thought it was a rally for President Donald Trump, not for white nationalists. "I don't really talk to him about his political views," she said. The Saturday crash that killed Heather Heyer took place at a Unite the Right rally spurred on by Charlottesville's plan to remove a Confederate statue from a local park. The rally was attended by neo-Nazis, skinheads and Ku Klux Klan members, and the white nationalists were met with hundreds of counter-protesters, which led to street brawls and violent clashes. Two Virginia State Troopers helping with the response to the clashes died in a helicopter crash. (Paul J. Richards/AFP/Getty Images) People receive first-aid after a car ran into a crowd of protesters in Charlottesville, Va., Aug. 12, 2017. Charlottesville Police Chief Al Thomas said at a news conference this afternoon that he "absolutely" has regrets. "We lost three lives this weekend. A local citizen and two fellow officers," he said. "It was a tragic, tragic weekend." Thomas defended the police department against criticism that police were not prepared for Saturday's violence and that they let the situation get out of hand. Thomas said the police had a plan agreed upon with the protesters, but the Unite the Right participants did not follow that plan. "They began entering at different locations in and around the park and we had to quickly alter our plans to help facilitate that process," he said. "Other groups also began amassing along the street and in the park. Gradually the crowd sizes increased, along with aggressiveness and hostility of attendees toward one another. Shortly before 11 a.m., individuals in the crowd began throwing objects and spraying chemical agents into the crowd. The city and county then made a declaration of local emergency. " "We were again hoping that the members of the alt-right rally would cooperate with our safety plan of ingress and egress," he said. "Once violent began to erupt, we changed officers into protective equipment." He also said trying to disperse the crowds was "certainly a challenge. We were spread thin." 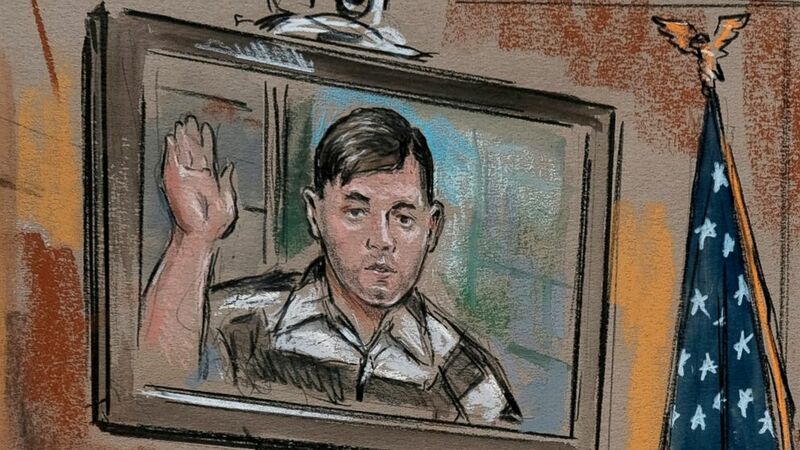 (Reuters) James Alex Fields Jr. is seen via video link from jail as he appears for his bail hearing at the Charlottesville City Court in Charlottesville, Virginia, Aug. 14, 2017. Thomas said the police are establishing a hotline so victims or witnesses can provide information that may not have been reported during the weekend. "We understand it was a traumatic weekend for everyone," he said. "We're still receiving reports of assaults and additional crimes and we're working with state and local partners to investigate thoroughly any criminal or civil rights violations that may have occurred this past weekend that have not yet been reported. "We are working with the Heyer family to ensure the safety of vigils and other memorials that are planned for this week are safe," Thomas said. ABC News' Eva Pilgrim, Andy Fies, Jack Date and Janet Weinstein contributed to this report.